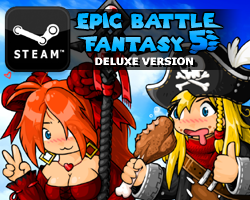 Hey guys, I’m working on Epic Battle Fantasy 3 at the moment. • Ads removed – except for links to EBF4 and BH2. • Small options menu somewhere, with mute, quality, fullscreen, fast forward, and window size buttons. Can’t promise all of those but I’ll try. • Less file compression on jpegs and music. That’s probably it to be honest. The game is made in ActionScript 2 (which is like 8 years out of date) so it’s unlikely that I’ll get any of the Steam features working. But I will see if it’s possible. I’m also not going to change stuff like spelling and grammar mistakes – because they’re everywhere and it would be a slippery slope to rewriting the whole thing. It’s an old game and it’s very poorly made by my current standards. I don’t want to waste any time fixing stuff I’m not happy with – because that’s most of the game. Anyway, I’ve got the game compiling and running correctly at the moment – which was tough actually, because a lot of the files were missing chunks for some reason. Luckily I managed to find backups. I was very stingy with Dropbox usage when I was on the free version back then. I’d like to think shipping this on Steam will only take a few days, but problems and distractions always come up, so we will see. This entry was posted in Epic Battle Fantasy 3 on August 9, 2016 by Matt Roszak. Sweet! 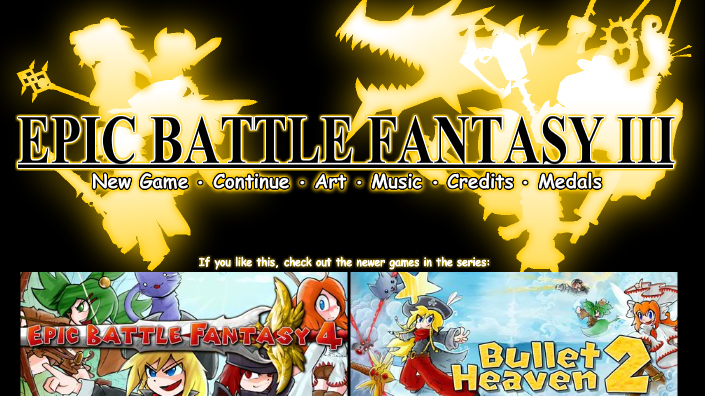 It’ll be fun to replay good ol’ EBF3 again! 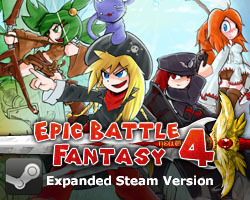 EBF3 is my favorite game of all time, so you should not talk about it like this. That masterpiece is so good, it gave me a feel that I can’t even describe with mortal words (in my life only two other things did the same effect: Death Note and Monster anime), so I simply call it godtier (because no human being can make things THIS good). I feel really bad about not purchasing any of your games but I don’t have enough money for it. When I get out of the student loans I will buy all of your games, so I can make your life a bit better because you made my life a lot better. I hope you read this and forgive me for not supporting the game development yet. Thanks, don’t worry about it! Not going to lie, I don’t like the ads on the title screen, they take up too much space and ruin the composition. Perhaps make them smaller and squarish, and have them pop up by hovering over a “OTHER GAMES” tab in the same style as the menu options. Also, since the game relies on the keyboard for movement, you should have support for alternative keyboard formats (AZERTY, DVORAK, etc.) for the international players. Maybe keyboard support for the whole game, like selecting in the menu? It would also be great if the game could run at 60 fps. I would probably appreciate a full-on remaster, but you’ve already said otherwise, so I guess it’ll be up to other people to try to achieve the feat. I’ll love to replay this for a 5th time, maybe it’s not the best, but it’s something great. In all honesty we left it on hiatus for so long it probably would’ve gone that way anyways. Anyways Matt, you may not think it’s your best work, but EBF3 holds a special place in my heart as what introduced me to your work, and what really got me interested in RPGs in general. Thank you so much for putting it on Steam.